Veganism has been on my mind for some time as partly an environmental issue and partly a health issue. It sort of loops in fits of start, stop, long pause and then start again. Meanwhile the recipe collection has been gathering more and more vegan entries. Reading recipes has been a past time ever since I could read. Even in elementary school I had shoe boxes crammed with recipes on a shelf in my closet. I still have some of those recipes (in nicer boxes) plus an ever expanding file on the PC hard drive; same fetish, different media. Thanks to being indoors recently due to weather and allergies some of the ones that are more intriguing and time consuming have made it to the kitchen. As a cheese lover the concept of nut ‘cheese’ made me wonder if that was even possible, how close was it to that flavor I so loved, and could it happen in my own kitchen? The process started several days ago with the purchase of raw almonds. Three days ago they went into a pan of water to soak so as to be able to remove the fibrous skin. The next day they were drained and skin removal began. It took at least an hour, likely more, and there were blisters forming on my thumbs – this was from about 1.5 cups of dry almonds. After all of the creamy white blanched almonds were done I put them in the fridge while I contemplated my sore thumbs. Finally, two days later, with thumbs on the mend, I made notes from several recipes, gathered ingredients and assembled the blender. (Note to self – really, really have to look into purchasing a high powered blender) It was a wrestling match, pushing down the mixture, resting the motor, keeping it from ‘walking’ on the higher speeds, and adding water after much agonizing over initial proportions. The basil was nicely distributed but when did I add pimiento? Rats! 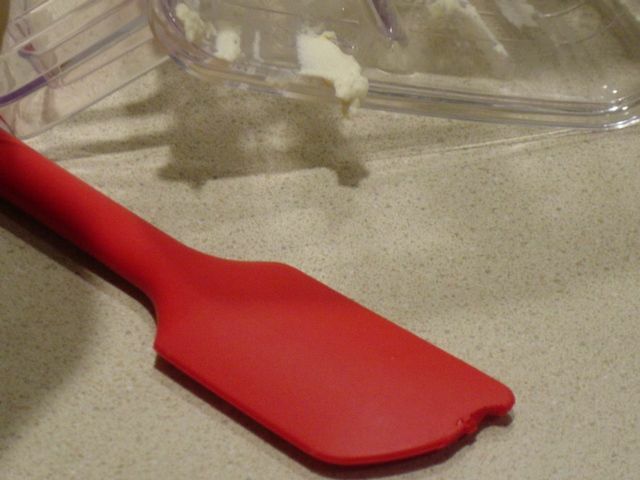 I had chipped up my favorite silicone spatula. Finally the mixture achieved an acceptable level of smooth. Between several layers of clean fabric, packed all into a strainer, it was set aside to drain (with silicone chips removed). Two hours later – no ‘draining’ observed . . . . Will this even be edible? Three hours later – the fabric is damp. It is probably time to put it in the fridge to mellow? Ripen? At least it smells fresh so hopefully this wasn’t a big waste of time. There are whole, natural raw almonds left in the bag. Most resources on the internet describe a very short time in hot water being the key to popping almonds right out of their skin. If (if) I try again, I will opt for this method over the long cold soak. In the meantime I’m consoling myself with something sweet and more antihistamine chased with an almond milk chai latte. 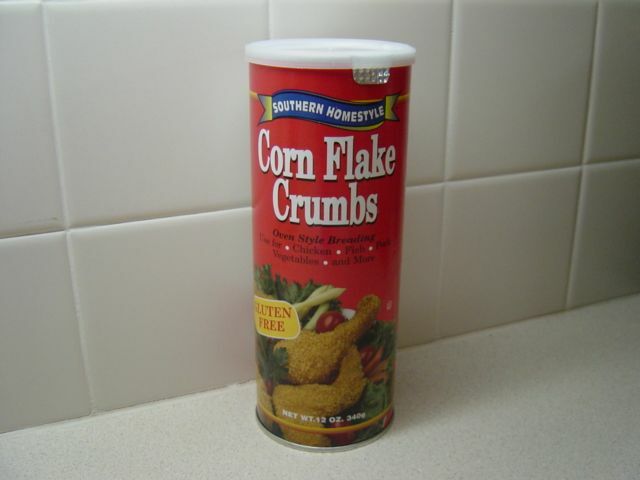 Homestyle corn flake crumbs? Did you ever make them ‘home-style’? 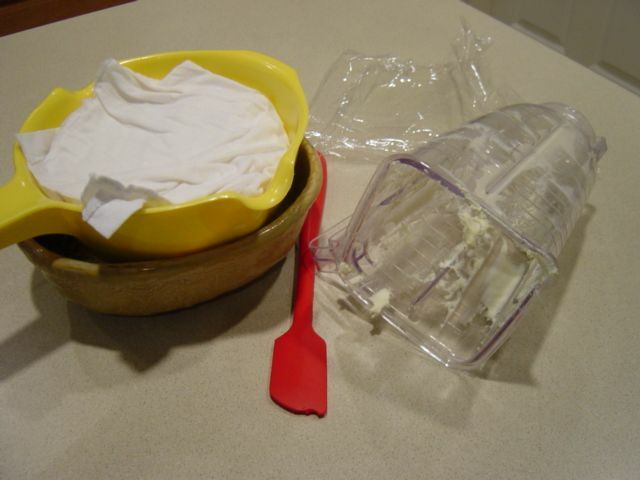 Pour corn flakes into a baggie and run the rolling pin over them which gave you multi-sized, crushed flakes ranging from large crumbs to powder? These gluten-free flakes from The SoyNut Butter Company are nicely uniform. I have used them occasionally as a substitute in cookies and crumb toppings when the pantry turned out to be bare of rolled oats that were gluten-free. Andrea and I were discussing crumb coatings one afternoon while at the fitness center and she shared with me her coating recipe for all manner of applications. This works for cutlets or patties of any type: chicken, pork, fish, bean patties, tofu, or whatever you have in mind. It bakes up nicely or sautés in a skillet. Andrea’s original recipe called for cracker crumbs but this works very well. We had it on baked tilapia one evening and it is savory and crunchy – a wonderful touch. Mix all of these ingredients together with a fork. Dip or roll your cutlets/patties to coat. Place on a baking sheet and bake at 400*F – 425*F or sauté in a skillet on the stove top. This product is available in Texas from H-E-B which carries most of the gluten-free items in my pantry. They can also be ordered online direct from The SoyNut Butter Company or through Amazon. Before the days of commercial-cream-of-whatever soup cooks made their own white sauces for gravy, soups, and creamy dishes. Chefs in upscale restaurants and on television cooking shows still make their sauces from scratch. And cooks at home in their gluten-free kitchens are learning the same technique. It is a simple process and it tastes better than the canned stuff. I recently baked up Scalloped Leeks and Potatoes using this sauce plus a bunch of leeks and about 1 1/2 pounds of small red potatoes. The potatoes were very lightly parboiled, cooled and sliced. The leeks were washed, sliced, seasoned, and sautéed. They were layered leeks, potatoes, leeks, potatoes, leeks, and topped with sauce in a 9 inch square oven proof dish and then baked for an hour at 350*F or until the potatoes were very tender. The dish should be allowed to cool somewhat (10-15 minutes) before serving. During the cooling process the potatoes will reabsorb some of the cooking liquid and be even creamier. Rice flour is the most neutral flour in taste and has no gooey or gluey surprises when combined with any of your other possible choices of fat or liquid. Real dairy butter and milk are the ultimate rich tasting options for the fat and liquid. But quality vegan margarine (or even liquid vegetable oil) and your favorite non-dairy milk can produce an excellent creamy result. Seasoning is the key for winning the taste-test sweepstakes. Just the right amount of salt and pepper plus some pleasing combinations from the herb section of your pantry will complete the sauce. Place the rice flour and margarine in a medium skillet. Set on the stove over medium heat. Stir gently while the margarine melts and absorbs the flour. Add about 2/3 of the liquid and keep stirring. While the mixture is heating add the seasonings. Add the remainder of the milk and bring the sauce to an easy simmer. When the sauce is thick remove it from the heat and adjust the seasonings to your taste.